Like it or not, fall will be here soon. I know some people cannot wait for fall to arrive, but I personally will be soaking up every ounce of summer until the fall weather arrives. Once fall is here, though, I will be all for it! I truly love each season. Well, if winter could be shortened by like a month I would be totally fine with that ha. That being said, now is the perfect time to start building your fall wardrobe. Even though I want to spend my days at the pool, get some final use out of my favorite shorts, and enjoy the longer amounts of daylight, I am still getting very excited for fall fashion. Classic pieces that return each year are starting to fill the shelves at stores. In addition, there are some great trends for fall this year. 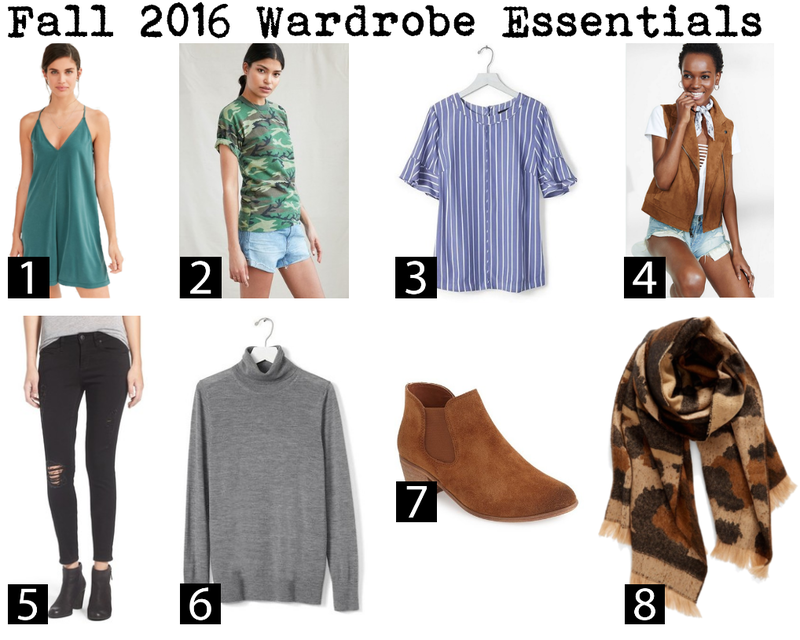 I've rounded up a list of 8 pieces I think you need in your fall wardrobe. Four are trendy pieces for fall and four are classic pieces you'll wear again and again. The best part, is that these pieces can all be mixed together to create different looks. Get a slip dress in plain black, and layer a camo top underneath. Put the suede vest over the turtleneck and pair it with the black jeans. Wear your striped flutter sleeve top with a skirt and booties now, and pair it with some jeans when it gets cooler. Wear the blanket scarf like a shawl and pair it with the slip dress and some studded heels for a fun night out look. Rock the black jeans with a camo top and suede vest for an edgier look. The options are endless! Keep reading to see why I love these pieces and to find more colors and styles for each piece. 1. The Slip Dress: Slip dresses have gradually been getting more and more popular. (This can be said for pretty much anything that resembles 90s fashion.) This is a great piece to buy now, because you can wear it now on it's own. As it gets colder, you can layer it. Wear a t-shirt underneath, add a leather jacket over top, put a turtleneck underneath, top it with a cozy cardigan. There are so many options! Worried about it looking like pajamas? Pick a bold pattern, a longer length, and avoid any lace. 2. Camouflage: Camouflage is not new to the trend scene. It's something that keeps coming back season after season. I have not purchased anything camouflage for so long. In 5th and 6th grade I had a camo t-shirt, much like the one in the collage above, that I was obsessed with. It's so funny how styles tend to come and go! I am currently debating between a camouflage t-shirt, jacket, or t-shirt dress. Which one do you think I should go with?! 3. Flutter Sleeve: Fun sleeves are having a major moment right now. Everything from over-sized bell sleeves to flutter sleeves can be found of various tops and dresses. (Remember this post with my flutter sleeve top?!) This small detailing is such a fun touch to an otherwise basic piece. This is a trend that can easily be worn to work, especially if the piece has structure like the top in the collage. 5. Black Jeans: If you already have a pair of black jeans, then I am sure you already understand just how versatile these are! I wear my black jeans constantly throughout the fall and winter. (See here and here for some ideas on how to style them.) They go with everything, and add some nice variation to your blue jeans. I already have a pair of black jeans, but this year I will be getting some new ones! 6. Turtlenecks: A turtleneck is simple piece that you will wear again and again. Wear it on it's own, layered under a dress (like I did here with a sweater), under a faux fur vest, etc. 7. Booties: I love pairing booties with everything. Dresses, skirts, and jeans all look good with booties! There are so many different options and colors you can choose for. For a trendier look, pick one that laces up, has a bold color, cut outs, or metallic accents. For a classic look, choose something more simple. If you invest in a good pair here, they will last you for years to come. (Make sure you store and treat them properly to really extend their life.) I am trying to decide which ones I want, and right now these are at the top of my wish list. 8. Scarves: No surprise here! Blanket scarves have been huge for going on two years now. (It all started with this plaid one.) Blanket scarves have now expanded to many different patterns and colors. I recently purchased the leopard print one and I can't wait to wear it. (For ideas on how I style my blanket scarf head here and here.) Not into the blanket scarf trend? Grab a smaller scarf (bandanna sized) and tie it around your neck (like in the suede vest picture). The smaller scarf is such a cute and on trend look at the moment! What part of fall fashion are you most looking forward to!? Let me know in the comments! great picks! Love that slip dress. I had some issues with Blogger too recently. You put together a super great list or Fall, loving all the shift dresses!! Happy Monday sweetness!! These are all such great fall staples! I absolutely LOVE that suede vest! I feel like I may just actually be in style this fall (for an old lady)! I bought booties and a blanket scarf from Nordstrom during their sale!! Woot! I'm loving all these fall essentials! I cannot wait for blanket scarves, but I love this leopard one too! I should have bought it during the sale. Such a great find! I will miss summer, but I do love fall! I hate winter, though! Bleh! I need to check out these flutter sleeves. I did get my first pair of black pants last year and I even wore them in the summer at times, they are versatile! Great picks, I cannot wait for fall. I'm so over this heat and humidity. That sleeveless vest is fabulous! All of these picks have me so excited for Fall! So many great pieces for fall! I love turtlenecks, so I'm looking forward to wearing those again once the weather cools off. I'm so excited for this fall! Everything looks so gorgeous, love your selection! Suede and velvet are definitely gonna be a big hit this season! Fall fashion is my favorite! I love boots and scarves and big cozy sweaters! Black jeans are a must - I love mine so much I bought a second pair! Hope you figure things out with Blogger. I had a time where some of my already published posts just disappeared...still don't know what happened there! Love these picks! Flutter sleeves, booties and scarves are so great! I'm totally looking forward to all the suede and all the booties this fall! They're just so pretty and fun to style! Great picks! Thought it is still pretty hot in LA, I am def ready for the temp to cool down a bit and wear booties and layers. I think the slip dress is my favorite especially for this summer heat we're experiencing but I do love a comfy pair of distressed black jeans. This makes me so excited for fall! Love that suede vest! I'm loving suede for fall! Great roundup! I'm loving your fall picks, especially that suede vest! Although fall is my favorite time of the year to dress for, I'm also not quiet ready! That suede vest is SO cool- such a great addition to the fall wardrobe! wow! so many fun picks! awesome post! I love this post! I am so beyond ready for fall and all of these rumblings of fall are making me so excited! Not too much longer and I will be pulling out the fall decor! EEK. Love all the items here, and love that you mentioned camo! I just ordered a camo dress that I was a little nervous about- you just helped wash that away:)! I love those booties. I can't wait for all the fall clothes! Ahhh booties and black jeans! My favorite! Love your picks! Fall fashion is my favorite!